(CBS/AP) BENGHAZI, Libya - Hundreds of protesters angry over last week's killing of the U.S. ambassador to Libya stormed the compound of the Islamic extremist militia suspected in the attack, evicting militiamen and setting fire to their building Friday. In an unprecedented show of public anger at Libya's rampant militias, the crowd overwhelmed the compound of the Ansar al-Shariah Brigade in the center of the eastern city of Benghazi. Who was strongman violently killed by rebels? Ansar al-Shariah fighters initially fired in the air to disperse the crowd, but eventually abandoned the site with their weapons and vehicles after it was overrun by waves of protesters shouting "No to militias." "I don't want to see armed men wearing Afghani-style clothes stopping me in the street to give me orders, I only want to see people in uniform," said Omar Mohammed, a university student who took part in the takeover, which protesters said was done in support of the army and police. No deaths were reported in the incident, which came after tens of thousands marched in Benghazi in a rally against armed militias. A vehicle was also burned at the compound, which was taken over by Libyan security forces after its occupants fled. For many Libyans, last week's attack on the U.S. Consulate in the eastern city of Benghazi was the last straw with one of the biggest problems Libya has faced since Qaddafi's ouster and death around a year ago -- the multiple mini-armies that with their arsenals of machine guns and rocket-propelled grenades are stronger than the regular armed forces and police. The militias, a legacy of the rag-tag popular forces that fought Qaddafi's regime, tout themselves as protectors of Libya's revolution, providing security where police cannot. But many say they act like gangs, detaining and intimidating rivals and carrying out killings. Militias made up of Islamic radicals like Ansar al-Shariah are notorious for attacks on Muslims who don't abide by their hardline ideology. Officials and witnesses say fighters from Ansar al-Shariah led the attack on the U.S. consulate, which killed Amb. Chris Stevens and three other Americans. After taking over the Ansar compound, protesters then drove to attack the Benghazi headquarters of another Islamist militia, Rafallah Sahati. The militiamen opened fire on the protesters, who were largely unarmed. At least 20 were wounded, and there were unconfirmed witness reports of three protesters killed. Earlier in the day, some 30,000 people filled a broad boulevard as they marched along a lake in central Benghazi on Friday to the gates of the headquarters of Ansar al-Shariah. "No, no, to militias," the crowd chanted, filling a broad boulevard. They carried banners and signs demanding that militias disband and that the government build up police to take their place in keeping security. "Benghazi is in a trap," signs read. "Where is the army, where is the police?" Suspicion for the attack has focused on Ansar al Sharia. It is so powerful that CBS News questions at the Interior Ministry made spokesman Izzedine Fezzen very nervous, CBS News correspondent Elizabeth Palmer reports from Benghazi. "We don't have enough power to catch them," Fezzen said. On Thursday night, an FBI team was preparing to fly to Benghazi to find out who carried out the attack, Palmer reports. The compound behind the walls of the consulate is the major crime scene, but any evidence left inside was badly contaminated by the looters and curious local people who flooded in after the attack, Palmer reports. At Friday's protest, other signs mourned the killing of U.S. Ambassador Chris Stevens, reading, "The ambassador was Libya's friend" and "Libya lost a friend." "Benghazi has been thrown wide open, it's full of chaos, looting and crime," said Ihsan Abdel-Baqi, a woman in her 50s who joined the march. "We want our dignity back. We are not afraid of anything." The giant crowd poured into a square in front of the main camp of Ansar al-Shariah in the city, unfurling a long Libyan flag and chanting, "With our lives and souls, we redeem you, Benghazi." Military helicopters and fighter jets flew overhead, and police mingled in the crowd. Several thousand Ansar al-Shariah supporters lined up in front of the camp in the face of the crowd, waving black and white banners. But there was no immediate friction between the two sides. 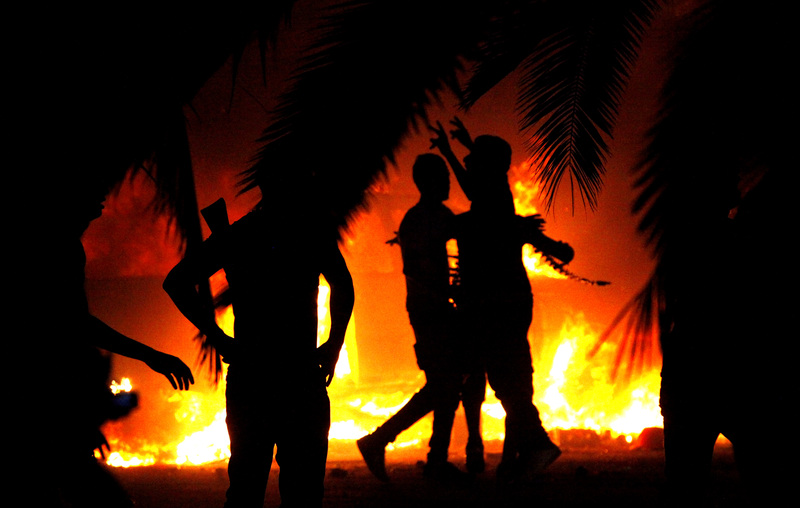 The militias first arose when Benghazi and the rest of the east rose up against Qaddafi's rule early last year. Residents formed local "brigades" that took up arms and fought regime forces. Over the civil war that followed such militias formed around the country. Since Qaddafi's fall and death around a year ago, the militias have remained in place and have grown stronger, boasting arsenals of automatic weapons, rocket-propelled grenades and pick-up trucks with heavy machine guns. Many have no particular ideological bent, but some are strongly Islamist. Their strength was on display in the Sept. 11 attack on the consulate. Heavily armed gunmen believed to be militiamen mixed in with a crowd of Libyans protesting an anti-Islam film outside the mission, Libyan officials say. Libyan security forces at the scene withdrew because they were heavily outnumbered and outgunned. The government has been unable to convince militias to disband or integrate into the regular army or security forces, which remain underfunded and weak. Many say authorities have inadvertently fueled the growth with a program that pays militiamen to join a state-sponsored council that does little to bring them under government control.